Window blinds are an extremely popular decorating option. But for blinds to look their best, they require regular care and maintenance, and some very definite “dos and don’ts” govern their cleaning. • Regular dusting with a microfiber duster, feather duster, or soft cloth is a benefit to all blinds. For best results, make sure the blinds are fully extended and that all of the slats are closed and facing the same way. Dust lightly, moving in the same direction as the slats, then turn 90 degrees and dust again. Tilt the slats in the opposite direction, then repeat. • For heavier dust, use the small brush attachment of a vacuum cleaner to go over the blinds, working in the direction of the slats. When using the vacuum, make sure that the suction is on its lightest setting to avoid twisting or warping the slats. • Blinds will need a more thorough cleaning once or twice a year. Take a microfiber cloth, terry towel, clean sock or cotton gloves and gently rub each slat from end to end, making sure to clean top and bottom. To remove heavier dirt and stains, you can lightly moisten the cleaning cloth with plain water or with a mixture of 25% white vinegar and 75% water. • Specialized dusting tools are available; most feature “fingers” that enable simultaneous cleaning of multiple slats. These dusters (also known as “trickets”) are typically constructed of microfiber, soft cloth, or sponges, and they are found in many hardware stores and home improvement chains. • These types of blinds can be cleaned with warm, soapy water; liquid dish soap works well. Remove the entire blind from the mounting hardware and place it in a bathtub or similar vessel (a kiddy pool in the yard, perhaps). • Use a soft brush, sponge, or soft mop to go over both sides of the slats with warm, soapy water before rinsing thoroughly. A hand-held shower attachment or spray nozzle on the hose is ideal for rinsing. Make sure to rinse away all of the soap suds to avoid spotting. • Dry the blinds with towels and re-hang. Make sure the blinds are open so that air can circulate between the slats. • After drying, wipe each slat with a fabric softener sheet to help repel dust. • For exceptionally dirty blinds, especially those in kitchens, use a degreaser, such as Fantastik, Simple Green, or 409. • Most wood blinds are treated with a special finish to repel dirt and stains. 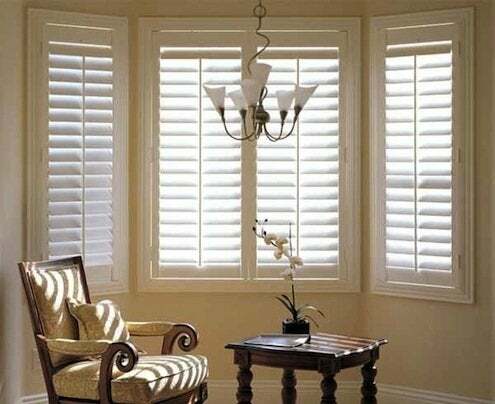 Wood blinds can be cleaned with a good quality furniture polish and a soft cloth or clean sock. Spray the furniture polish on the cloth and wipe each slat individually. Avoid touching the cords. • For heavier cleaning, you can use plain water, but be careful not to saturate the wood. Wipe excess water immediately to prevent spotting, discoloration, or warping. • Fabric blinds can be tricky to clean. For regular dust and dirt, use a vacuum cleaner, compressed air sprayer, or hair dryer. • For heavier dust, wipe each slat gently with a dry sponge. • Extremely soiled fabric blinds may need professional cleaning. – Be careful not to press too hard on metal blinds to avoid bending or damaging the slats. – Don’t let water pool on blinds—this can cause spotting. 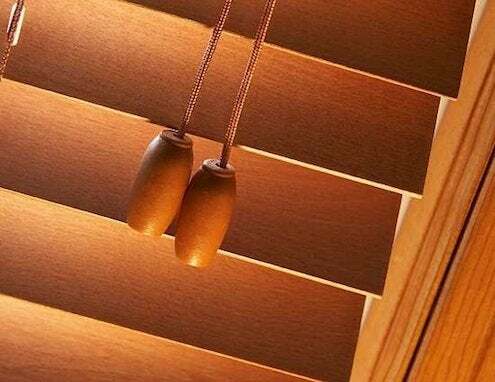 – Avoid using furniture oil on blinds; it can leave streaks and actually attract dust. – Protect blinds when cleaning windows by spraying the glass cleaner onto a cloth rather than onto the glass. 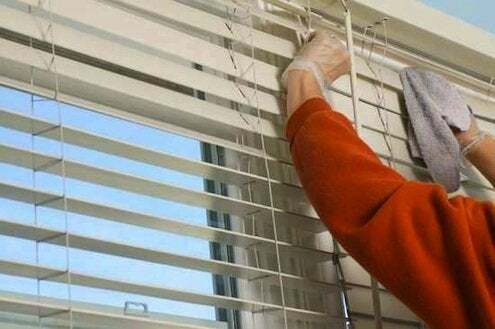 – Never use abrasive cleaners or harsh chemicals on blinds, because these products can scratch, discolor, or warp the slats. – Do not use alcohol, baby wipes, or alkaline cleansers, as these contain harsh compounds that can stain or destroy the finish on the blinds. Remember, regular dusting is key—taking a proactive approach to cleaning blinds will keep your window fashions looking fabulous!